Design • Older spans are held up by engineering, not brute strength, redundancy. Seattle • Thousands of bridges around the U.S. may be one freak accident or mistake away from collapse, even if the spans are deemed structurally sound. The crossings are kept standing by engineering design, not supported with brute strength or redundant protections like their more modern counterparts. Bridge regulators call the more risky spans "fracture critical," meaning that if a single, vital component of the bridge is compromised, it can crumple. Those vulnerable crossing carry millions of drivers every day. In Boston, a six-lane highway 1A near Logan airport includes a "fracture critical" bridge over Bennington Street. In northern Chicago, an I-90 pass that goes over Ashland Avenue is in the same category. An I-880 bridge over 5th Avenue in Oakland, Calif., is also on the list. 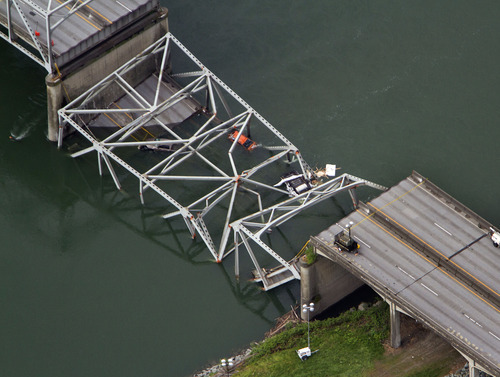 Also in that category is the Interstate 5 bridge over the Skagit River north of Seattle, which collapsed into the water days ago after officials say an oversized truck load clipped the steel truss. Public officials have focused in recent years on the desperate need for money to repair thousands of bridges deemed structurally deficient, which typically means a major portion of the bridge is in poor condition or worse. But the bridge that collapsed Thursday is not in that deficient category, highlighting another major problem with the nation&apos;s infrastructure: Although it&apos;s rare, some bridges deemed to be fine structurally can still be crippled if they are struck hard enough in the wrong spot. "It probably is a bit of a fluke in that sense," said Charles Roeder, a professor of civil and environmental engineering at the University of Washington. While the I-5 truck&apos;s cargo suffered only minimal damage, it left chaos in its wake, with two vehicles catapulting off the edge of the broken bridge into the river below. Three people involved escaped with non-life threatening injuries. The most famous failure of a fracture critical bridge was the collapse of the I-35W bridge in Minneapolis during rush hour on Aug. 1, 2007, killing 13 people and injuring more than 100 others. The National Transportation Safety Board concluded that the cause of the collapse was an error by the bridge&apos;s designers  a gusset plate, a key component of the bridge, was too thin. The plate was only half of the required one-inch thickness. Because the bridge&apos;s key structures lacked redundancy, where if one piece fails, there is another piece to prevent the bridge from falling, when the gusset plate broke, much of the bridge collapsed. Mark Rosenker, who was chairman of the NTSB during the I-35W bridge investigation, said the board looked into whether other fracture critical bridges were collapsing. They found a few cases, but not many, he said. "Today, they&apos;re still building fracture critical bridges with the belief that they&apos;re not going break," Rosenker said. Fracture critical bridges, like the I-5 span in Washington, are the result of Congress trying to cut corners to save money rather than a lack of engineering know-how, said Barry B. LePatner, a New York real estate attorney and author of "Too Big to Fall: America&apos;s Failing Infrastructure and the Way Forward." About 18,000 fracture critical bridges were built from the mid-1950s through the late 1970s in an effort to complete the nation&apos;s interstate highway system, which was launched under President Dwight Eisenhower, LePatner said in an interview. The fracture critical bridge designs were cheaper than bridges designed with redundancy, he said. Thousands of those bridges remain in use, according to an AP analysis. "They have been left hanging with little maintenance for four decades now," he said. "There is little political will and less political leadership to commit the tens of billions of dollars needed" to fix them. There has been little focus or urgency in specifically replacing the older "fracture critical" crossings, in part because there is a massive backlog of bridge repair work for thousands of bridges deemed to be structurally problematic. Washington state Rep. Judy Clibborn, a Democrat who leads the House transportation committee, has been trying to build support for a tax package to pay for major transportation projects in the state. But her plan wouldn&apos;t have done anything to revamp the bridge that collapsed. National bridge records say the I-5 crossing over the Skagit River had a sufficiency rating of 57.4 out of 100  a score designed to gauge the ability of the bridge to remain in service. To qualify for federal replacement funds, a bridge must have a rating of 50 or below. A bridge must have a sufficiency rating of 80 or below to qualify for federal rehabilitation funding. Hundreds of bridges in Washington state have worse ratings than the one that collapsed, and many around the country have single-digit ratings. Clibborn said the Skagit River crossing wasn&apos;t even on the radar of lawmakers because state officials have to prioritize by focusing on bridges with serious structural problems that are at higher risk of imminent danger. Along with being at risk of a fatal impact, the I-5 bridge was deemed to be "functionally obsolete," which essentially means it wasn&apos;t built to today&apos;s standards. Its shoulders were narrow, and it had low clearance. There are 66,749 structurally deficient bridges and 84,748 functionally obsolete bridges in the U.S., including Puerto Rico, according to the Federal Highway Administration. That&apos;s about a quarter of the 607,000 total bridges nationally. States and cities have been whittling down that backlog, but slowly. In 2002, about 30 percent of bridges fell into one of those two categories. Spending by states and local government on bridge construction adjusted for inflation has more than doubled since 1998, from $12.3 billion to $28.5 billion last year, according to the American Road and Transportation Builders Association. That&apos;s an all-time high. "The needs are so great that even with the growth we&apos;ve had in the investment level, it&apos;s barely moving the needle in terms of moving bridges off these lists," said Alison Premo Black, the association&apos;s chief economist. There is wide recognition at all levels of government that the failure to address aging infrastructure will likely undermine safety and hinder economic growth. But there is no consensus on how to pay for improvements. The federal Highway Trust Fund, which provides construction aid to states, is forecast to go broke next year. The fund gets its revenue primarily from federal gas and diesel taxes. But revenues aren&apos;t keeping up because people are driving less and there are more fuel-efficient cars on the road. Neither Congress nor the White House has shown any willingness to raise federal gas taxes, which haven&apos;t been increased since 1993. Many transportation thinkers believe a shift to taxes based on miles traveled by a vehicle is inevitable, but there are privacy concerns and other difficulties that would preclude widespread use of such a system for at least a decade. Transportation spending got a temporary boost with the economic stimulus funds approved by Congress after President Barack Obama was elected. Of the $27 billion designated for highway projects under the stimulus program, about $3 billion went to bridge projects, Black said. States are looking for other means to raise money for highway and bridge improvements, including more road tolls, dedicating a portion of sales taxes to transportation and raising state gas taxes. Clibborn, the Washington state lawmaker, has proposed a 10-cent gas hike to help pay for projects, though the effort has been held up by a dispute over how to rebuild the Columbia River bridge connecting Vancouver, Wash., and Portland, Ore.
"We can&apos;t possibly do it all in the next 10 years, but we&apos;re going to do the first bite of the apple," Clibborn said.